The UAF is continuing its rotation and heavy weapons withdrawal from the front line in anticipation of the winter. Thus the UAF “lost” a T-64B tank after the truck towing the tank-bearing flatbed trailer broke down. The tank sat in the middle of Kharkov entirely unattended for several hours before another truck showed up and towed it away. We reported last week that the Ukrainian military had, by the most optimistic estimate, 19 operational Su-25 attack aircraft. Now that number has been reduced to 18 following the crash of an Su-25 near Dnepropetrovsk. Ukrainian authorities are still trying to come to grips with the causes of ammunition storage explosion in Svatovo reported last week. 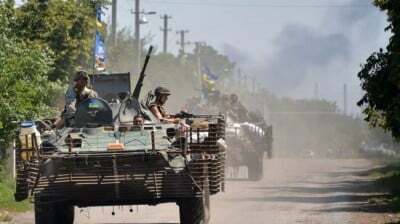 The military prosecutor general Anatoliy Matios believes the cause was carelessness of the officers responsible for the facility …while the occupied Lugansk Region governor Georgiy Tuka believes it was a terrorist attack. Well, why not both? A terrorist attack by the careless officers responsible for the facility? There are also news concerning the Ukrainian naval forces. The country has received the first new-construction naval vessel since it became “independent” a quarter of a century ago. The ship, to be sure, is not overly impressive–it is the Gyurza-M 51-ton coastal/riverine gunboat apparently armed with two weapon modules sporting a 30mm automatic cannon and anti-tank guided missile launchers. The vessel’s construction actually began during the rule of President Yanukovych. Meanwhile, the Malyshev plant in Kharkov is officially hoping to win the Pakistani contract for some 300 MBTs, the slow pace of deliveries of Oplot-M tanks to Thailand (average of 6 per year!) could well become a major problem for Malyshev’s further export prospects. Furthermore, there are credible reports that, following the scandal with the sub-standard armor plating on armored vehicles supplied by Ukraine to Iraq, Thailand requested that its Oplots be made with Russian armored steel. The number of UAF soldiers who have defected to Novorossia is continuing to grow, and the defectors are now engaging in media operations to try to convince soldiers still in UAF’s ranks to follow in their footsteps. The news from the “western front” are also fairly dismal. Even though the joint US-Ukrainian training mission that began back in April of 2015 has just concluded, it received practically no coverage within the Ukrainian media. Likewise the US has not trumpeted this huge “breakthrough” in bilateral relations. The reasons for this interesting development are open to speculation. In all likelihood, the US side was not overly impressed with the quality of Ukrainian participants and has decided not to continue the practice which is very costly to the US and is yielding no practical results. Instead, US “aid” programs to Ukraine seem to be mainly oriented to benefit US defense contractors, not the UAF. Since the Humvees supplied to Ukraine by the US now turned out to be over 20 years old, the US is now offering Ukraine a modernization program whose cost would be comparable to the value of the vehicles when they were brand new! Naturally, the modernization program would come out of the US aid budget for Ukraine and would be spent entirely on US defense firms qualified to repair these elderly vehicles.